Roger Casey Jr. heads up our construction division. 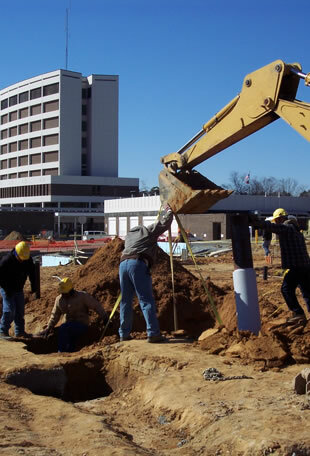 This division of our company handles the large plumbing and utility construction for commercial, industrial, and government customers throughout North Carolina. Our construction team can handle utilities, medical gas, underground gas piping and anything else that deals with piping or plumbing. We are currently working on projects at Seymour Johnson Air Force Base and several area hospitals including Wayne, Wilson, Pitt, and Lenoir Memorial as well as Craven Regional Medical Center. We are also working on water treatment plant projects in New Bern and Jacksonville, NC. We handle each project with the same great service and work ethic and have received letters of praise due to our exellent timeliness and people skills. Our project managers have over 115 years of combined experience and our work crews go about their jobs with the utmost in professionalism and precision.